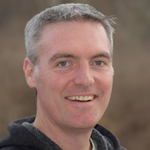 More than a while ago, I wrote about populating query results to a picklist for use in a Visualforce page. That post receives a lot of traffic and I get some additional emails regarding that topic. So I thought I would put together another post similar to that one but with a bit of a twist. In the sample I will cover in this post I am going to show you how to use the methods for the Describe Result sObject in order to create picklists within Visualforce pages. This could come in handy if you wanted to do something like provide criteria for searching Salesforce objects using a Visualforce page. So that you can make the best use of this code I am going to use the standard User object so that you can simply cut and paste the code from this sample into your Sandbox or Developer org. The real meat of the code is the getPickValues method in the class above. This is the portion of the code that populates the list, which will be used as picklist options in the Visualforce page. Although I could have hard-coded the object and the field for which I want to grab values, I did not. This was done so that I could reuse the code in order to grab picklist values via the describe call for more than one object or more than one field. You can see the application of this concept with the getLocales, & getTimeZones portions of the logic. Also, I wanted to illustrate how you could place a default value or something within your picklist. This was done above by passing the first_val string to the getPickValues method. 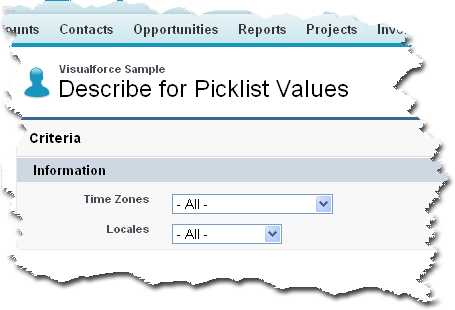 If, in fact, I was going to use the picklists that I build in a Visualforce search page or something then I would want to provide my users with the option of selecting "All" vallues from the picklist. Although I didn't include the logic here you could check if the selection was for All downstream in order to facilitate a more usable Visualforce page. If you copied and pasted the code in this sample into one of your orgs then you should see the page that I have illustrated above. This test will provide 100% coverage for the code as it is provided in this sample. I know you will tweak it so the test class is really just a starting point. Again, this is just another way to populate a picklist in a Visualforce page but this time using the methods for the Describe Result sObject.